In the list of Absentee Voters in Bottesford, 1918/19, he was recorded as a Lieutenant, 5th Yorks and Lancs Regiment, and his address was given as Rutland House, Church Street. 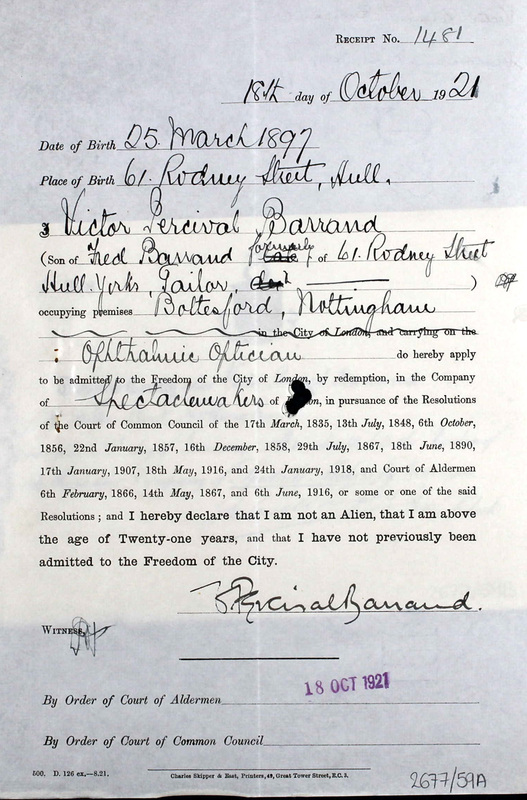 Victor Percival Barrand was born at 61 Rodney Street, Sculcoates, Hull, on the 25th March, 1897. 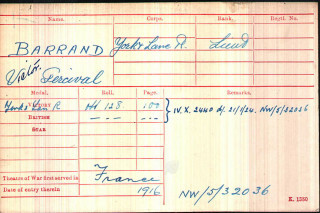 His father was named Fred Barrand, a tailor, born at Grantham in 1869. His mother was Maria Percival Barrand (nee Palmer), born in Grantham in December 1865. Victor and his elder brother Wilfred both enlisted during WW1. In 1901, Victor was living with his mother, his maternal grandfather, and a cousin named Percy Gunn, at Westgate, Grantham. His grandfather, Robert P. Palmer, born about 1836, was a “baker and shopkeeper”. In 1911 he was living at the School House, Grantham Road, Bottesford with, his uncle Victor George Collet, head master at Bottesford village school, and his wife Mary Elizabeth Collet (nee Palmer), Victor’s aunt. In addition, there was grandfather Robert Palmer, Victor’s mother, Victor himself and his elder brother Wilfred Joseph Barrand. Victor was a 14 years old schoolboy, Wilfred a 17 year old farm labourer. The Grantham Journal reported that Cadet Victor Barrand had joined the Yorkshire and Lancashire Regiment on the 22nd July, 1916. He was then 19 years old. 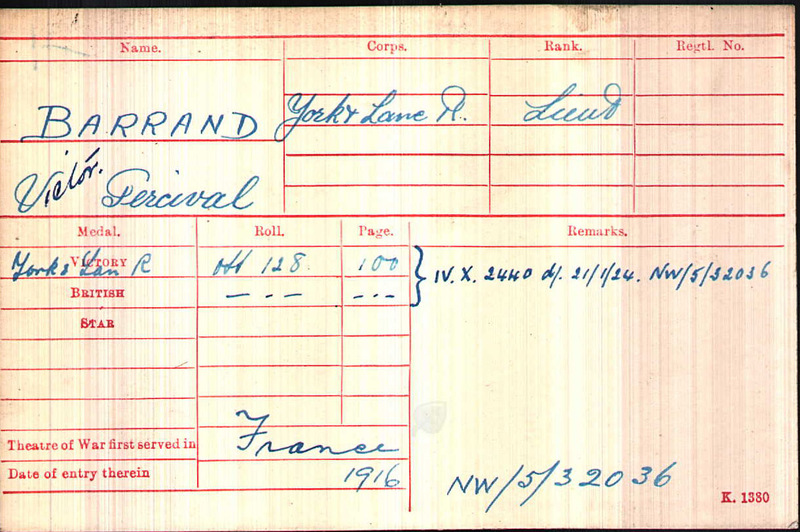 Online searches have located his Medal Index Card, which records that he was a Lieutenant in the 5th Battalion, Yorks and Lancs Regiment, and was posted to France in 1916. 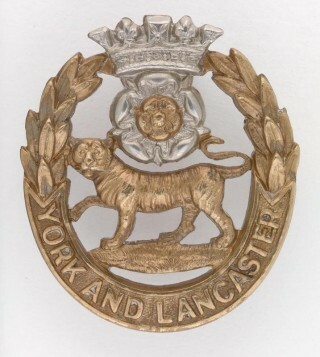 At the end of the war he was awarded the Victory Medal and British War Medal. 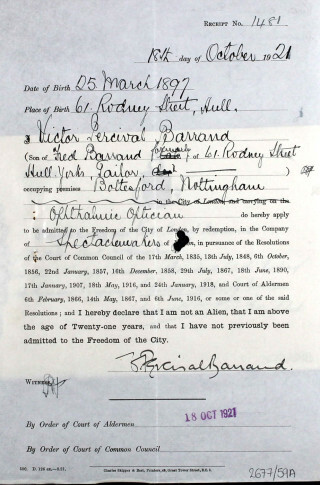 In 1919, the list of Absentee Voters in Bottesford gave his address as Rutland House, Church Street. In 1921, he had become an ophthalmic optician working in Bottesford but now living in Nottingham. On the 18th October, 1921, he applied to be admitted to the Freedom of the City of London in the Company of Spectacle Makers. 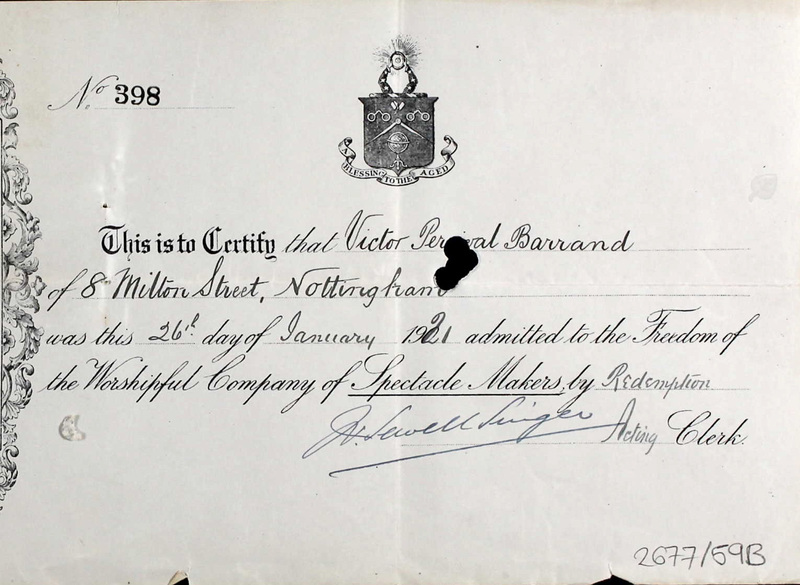 His admission Certificate, dated 26th January, 1921, gives his address at this time as 8, Milton Street, Nottingham, and his work premises as being in Bottesford. The dates of his application and admission papers are clearly inconsistent, but the reason for this is uncertain. It may have been a simple clerical error, but if this was the case then it is perhaps surprising that it was not corrected. He married Marian Shinner at Thornbury (or Almondsbury), Gloucestershire, on the 16th June, 1928, aged 31. His bride was born in 1905, daughter of Charles Herbert Shinner. Victor’s father, Fred Barrand, was a witness. The two alternative wedding locations are given in separate registers, but the places named are quite close together, north of Bristol, so the inconsistency is probably not significant. Victor Percival Barrand died in June, 1973, at Weston-Super-Mare, Somerset, aged 76. His wife, Marian, died in 1979 at Bristol, aged 74.